The Conventional Versus the Quiet Inverter Generator – Who Wins? What’s Your Generator to Be Used For? A Quiet Generator Produces how Many Decibels? There are so many different types of portable generators that you could choose from. Choosing a quiet portable generator will benefit you and your neighbors or fellow campers, by making sure that electric power is generated quietly and peacefully. Having a quiet generator makes sure that nothing breaks your concentration. You will, therefore, do all your daily tasks in a noise-free environment. Weight	 46.5 lb. 44 lb. 48 lb. 48.5 lb. 48 lb. Weight	 46 lb. 97 lb. 95 lb. 131 lb. 47.41 lb. 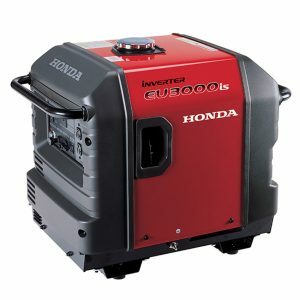 The Honda EU2200i is one of the 10 best quiet portable generator that you can rely on for an efficient electrical power. Just weighing 46lbs, it delivers a magnificent 2kW at peak; and 1.6kW while running. This is just enough to power up some of your electrical gadgets or devices such as a refrigerator, television or a computer laptop. On a full 1.1 gallons fuel tank, this generator runs for 4 hours at full capacity (100%); and 9 hours 40 minutes at 25% workload. You can then keep all your electrical appliances and gadgets, both AC and DC, up and running without experiencing any problem. Furthermore, it has two types power outlets- two AC and one DC outlet. This appliance or generator is fuel efficient. It has an eco-throttle technology that adjusts the generator to only provide the needed electrical power. Assuming you are running a 600W electrical appliance, the Honda EU2000i will only provide you with 600 watts, thus saving you some money. The eco-throttle also makes sure that the generator revs according to the workload you subject it to. This then helps reduce noise that is produced during operation. 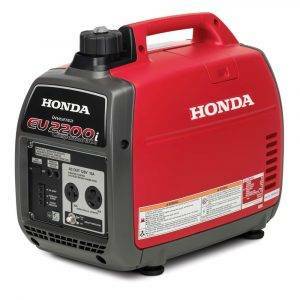 The generator comes with a circuit breaker that protects your Honda EU2000i generation from any over load. Additionally, this generator comes with twin tech capabilities. This technology makes it possible for you to connect another generator of same model as Honda EU2000i, in a tandem connectivity in case you require a higher electrical power output. Read our full Honda Quiet Generator Review. This is a gasoline powered lightweight quiet generator. 0.95 gallons fuel tank capacity. It runs on a 4stroke, air-cooled, Honda GX120 OHV engine. It has an eco-throttle system that controls the revving of the engine. This boost fuel efficiency. It’s a quiet generator, producing only 59 decibels at maximum load, and 53 decibels at 25% load. It has special materials inside its build, to help dampen sound. It has a 125V duplex AC outlet and a 12V DC outlet, perfect for charging your batteries. It gives you the chance to expand your electrical power needs by connecting a similar model to your home. Has an oil alert design that will let you know when your oil level is low. It has voltage and wattage overload protection mechanism. Has a USDA-qualified spark arrestor, and its EPA, CSA and CARB approved. Has a parallel capability that lets you step up your electrical power output using another generator of the same make and model? It is fuel efficient, thanks to its eco-throttle system. It’s a quiet and portable generator that you could carry to your campsite. It doesn’t have a fuel gauge. Knowing how much fuel you have left is a challenge. It’s unsuitable for heavy duty electrical appliances and/or tools. It doesn’t have an LCD display that could show you power output, voltage and running time. Has not electric start button. The Yamaha EF2000iSv2 runs on unleaded gasoline for 10 hours 30 minutes, at 25%workload. It produces 2000 watts when it starts, and 1600 watts when it’ running. It is, therefore, suitable for lightweight appliances, or few electrical appliances. It is an ideal electrical power source during leisure activities such as camping, fishing and tailgating. It’s a quiet generator that only produces 51.5 decibels when running at 25% load; and 61 decibels when it is running at its full capacity, which is 100% load. But all in all, it is a quiet generator, thanks to its high tech design that incorporate noise-absorbing glass wool into its stylish build. Also, it has rubber feet to help reduce further, the noise it produces. And with its twin tech capabilities, you could use this generator in a parallel connection to a similar model, to power more electrical appliances if you want more appliances up and running. This is a game changer that not so many quiet portable generators have. The Yamaha EF2000iSv2 also features an electrical overload protection, which works to protect the circuit inside it from damage in case you are trying to overload this dedicated powerhouse. And weighing about 44lbs, it is very easy to transport and carry around. You could simply lift it up and place it inside the back of your SUV and then head into the woods for camping. Read our full Yamaha 2000 generator Review. The generator is powered by unleaded gasoline. The engine is a 4 stroke, air-cooled OHV single cylinder, with cast iron cylinder liner. Fuel tank capacity is 1.1 gallons. Starting watts stands at 2kW; and the running watts is 16000 watts. It has an AC electrical output- 120V 16.7A. It also has DC electrical output- 12V 8A. It has a recoil starter. Hast an auto shutoff for low oil level. It is a quiet lightweight generator since it produces only 51.5-61dBa, and weighs just 44 pounds. It is also fuel efficient because it has an economy switch mode that makes sure that only enough power is produced; and not excess power. It’s a very clean, safe and reliable source of electrical power. It expands connectivity of your appliances to electricity generators, since it has the twin tech capability that lets you combine it with another model. It provides a limited electrical power that cannot power all your electrical appliances or devices. It doesn’t support heavy duty usage. When buying it, the oil is not included. 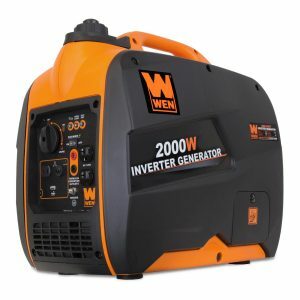 Another quiet portable generator that you could buy for your camping excitements is the WEN 56200i generator. 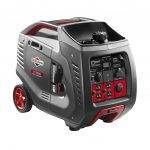 Equipped with a 4 stroke OHV 79.7cc engine, this generator produces 2kW when starting; and 1600 watts when running. And at 100% load, it runs on 1 gallon of gasoline for 4 hours, and 6 hours at 50% load. This is a very magnificent timeframe, given the amount of electrical power that it produces steadily and efficiently. 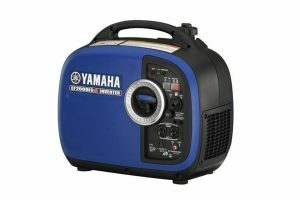 Producing just 51 decibels of sound at 25% load, and 55dBa at 75% load, this generator qualifies to be in this list of 10 best quiet portable generators. It will make sure that you have a quiet electrical power source in your campsite. Your neighbors won’t therefore complain about any noise in the area. This generator also has the economy mode, which works by adjusting this generator so that it only produce the required electrical power. This enhances fuel economy thus saving you some expensive running cost. However, the eco mode only works when you subject this, otherwise great generator, to below 1kW workload. In case you are only using 500 watts electrical appliances, the eco mode will come in handy! This generator is best for light electrical usage, such as powering your electrical light bulbs and small appliances running for half the night after a major power outage. Read our Full Wen 56200i Generator Review. It uses a 4 stroke 79.7cc OHV engine to produce electrical power that you need. Its fuel tank capacity stands at 1 gallon. Maximum electrical power output when it has just started is 2kW; and 1.6kW when it is running. It has a sine wave technology that will make sure that you have a pure, safe electrical power for your appliances. It has a low oil indicator, and an automatic low oil shutoff. It has two 3-prong outlets; a 5V USB port; and a 12DC port or outlet. It’s EPA III and CARB compliant. Weighs just 48lbs. This lightweight portable generator provides a clean and safe electrical energy which doesn’t fluctuate, to your light electrical appliances and devices such as bread toaster and a laptop. The unfluctuating electrical energy protects your valuables that you bought with your hard-earned money, thus saving your wallet. The generator is ecofriendly because it provides a clean and safe energy quietly. The generator is also fuel efficient, thanks to its economy mode. Since it weighs just 48lbs, it’s a portable source of electricity. This product comes with an excellent customer support. It has a poorly designed oil compartment that might pose a challenge to you when you are pouring oil into it. This generator does not come with a grounding wire. You will have to buy a grounding wire separately. Otherwise, this is one of the best camping generators that you should buy for your camping needs. 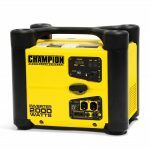 Another quiet portable generator that you could rely on for your camping or tailgating is the Champion 2000-Watt portable quiet generator. It’s quiet since it only produces 53 decibels of sound. And it’s portable since it only weighs 48.5 pounds. It performs excellently for its size and weight. With its 80cc Champion engine, this quiet portable generator produces and amazing 2kW starting power, and 1.7kW running power. You could power some of your basic appliances in your RV such as lights, TV, modem or router, and your phone’s charger sufficiently an efficiently. However, this generator unit isn’t recommended for emergency power backup for heavy-duty appliances such as the air conditioner, stoves, sump pumps and furnace fans. It’s only for lightweight electrical appliances such as the ones named herein. This generator also comes with a recoil start, and a cold start technology that will ensure that it starts even in cold weather environments. Also, this generator comes with a smart economy mode which makes sure that it provides only the needed electrical power. Other features include low oil shutoffs, its EPA and CARB compliant and it comes with a 3 year limited warranty. It fuel tank capacity is 1 gallon. Gas tank is made of steel. It produces 2000W starting power; and 1700W running power. On a full tank, it runs for 9hours 30minutes on gasoline when it’s at 25%load. Allows a parallel connectivity with another champion generator of the same model. It produces 53 decibels of sound from 23 feet away. Has recoil start. Also has cold start technology. It’s very affordable since you could get it from $488.89 from online stores. It’s very quiet. It produces only 53 decibels of sound from 23 feet away. It produces clean electrical power that you could use to power even your most sensitive electrical appliances. It has smart economy mode to increase its fuel efficiency. It comes with a 3 year limited warranty, and a lifetime technical support. It’s unsuitable for commercial use since it produces lightweight electrical power that cannot run heavy-duty tools and/or electrical appliances. Some customers complain about quality issues. 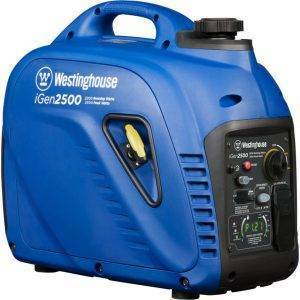 The Westinghouse IGEN2500 is a gasoline powered quiet portable generator. Just weighing 48lbs, it delivers an impressive 2.5kW of electrical power at the start, and 2.2kW of electricity when it’s running. The generator is designed to help you easily use it. For example, it has an LED display that shows you, just by glancing at it, how much fuel you’re using, and the workload percentage that your generator is running at. It also has a simple to use control panel. Westinghouse IGEN2500 has dual quiet mufflers that makes sure that it produces a clean and safe electrical energy safely. Also, it has a double insulated hood that makes sure that the whole generator set stays cooled while in operation. An asymmetrical fan cools the generator further. The economy mode, which is incorporated into this generator’s design makes sure that it runs at low revs when at low workloads. This will ensure fuel economy, which will in turn save you some cash. Moreover, the customer service by this generator company is excellent. They have a nationwide customer support. You will get assistance when you need help with your newly bought generator set. This generator weighs just 48lbs. It has built-in carrying handle for a very easy transportation. It has an eco-mode technology. Starting watts is 2.5kW, and running watts is 2.2kW. It has 120V 20A, AC power outlet, and two 5V DC outlets. Has a quiet operation since it has mufflers that absorb some sounds produced. Also, it runs at low revs on low workload, thus reducing the sound level even further. 1 gallon fuel tank capacity. Fuel efficient because it has an eco-mode tech that adjusts the generator to provide only the needed electrical power. This generator is fuel efficient. It has the ability to adjust the engine speed so that it only provides the required electrical power, based on the workload. It is an easy-to-use generator. It has an LED display that shows the electrical power output by the generator; the voltage of your electrical appliances and the remaining run time. It is a quiet generator, operating at 53 decibels of sound level from 23 feet away. This quiet portable generator is unsuitable for heavy duty electrical power appliances and/or tools. It lacks wheels that you could use, for easier transportation. 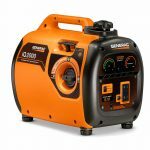 The GENERAC 6866 iQ2000 is another quiet portable generator that you could buy for your camping or tailgating expeditions. It’s a generator packed with a robust mixture of efficiency; reliability; high tech; and performance, to give you a quietly generated electrical power for your electrical appliances. Just weighing slightly over 46lbs, it produces a clean, steady 2kW of electrical power at the start, which then lowers to a stable 1.6kW during running time. This electrical power lets you connect your favorite electrical devices and appliances such as a sensitive LCD TV or laptop to a very reliable and efficient alternative source of electricity. Its engine is made with a technology that lets your generator run according to the required workload that your appliances need. For example, if your need to power up appliances whose total wattage is 900 watts, this generator’s engine will run to produce only 900watts of electrical power. As such, this generator is fuel efficient. And should there be need for a higher electrical power to, say, your home, this generator provides its users with the option of connecting it to another generator of the same model in a parallel connectivity. You will then have two powerhouses whose electrical output is twice the output of one GENERAC 6866 iQ2000 quiet portable generator. The generator also has choke-full electric features that lets you know the total wattage of your electrical appliances; their voltage and even the electric current that it’s producing. Read our full Generac IQ2000 Review. It uses a one cylinder, 4-stoke air-cooling 80cc GENERAC OHV engine to produce electricity. Its fuel tank capacity is 1.06 gallons. It has a recoil style start. It has a varied speed engine that revs according to the workload, thus increasing the run time if you’re using a low wattage. It runs on gasoline fuel type. It runs with a frequency of 60Hz. Produces a 120V 13.3A AC electricity output. Runs for 5.7 hours when under 50%work load. The generator is fuel efficient. It runs at the required speed, based on its workload thus, consuming gasoline efficiently. It has an easy-to-use control panel. The choke-full electric features need regular repairs for them to work optimally and effectively. It idles roughly, making it a bit louder when under a heavy workload. The Briggs and Stratton 30545 P3000 PowerSmart series quiet generator provides an efficient power that you could use for your camping, RV and even tailgating. It features an LCD display that provides you with visibility to very important performance metrics such as running time and the voltage that your generator is producing. And for easy portability, it comes with a luggage-style handle and 6 inch wheels. These features makes transporting this generator to wherever you’re going very easy. 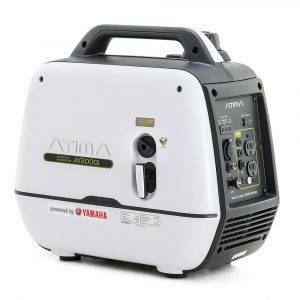 And for this portability features, this generator is best for campers. It produces 3000W starting power and 2600W running power. With this power, you could run your RV’s lights, refrigerator, other electronic devices such as laptops, and your phone’s charger. When this power isn’t enough, you have the option of connecting another Briggs and Stratton 30545 generator with this generator in a parallel connectivity. This generator has a port that will allow you to connect it with another generator of the same model. When you combine two Briggs and Stratton generators, you will get 4800W electrical power which is sufficient to power up your home during major power outage. Comes with a 1.5 gallons fuel tank capacity. Runs on a full tank of gasoline for 10 hours at25%workload. It has PowerSmart that revs the engine according to the load, thus saves fuel when your loads are lightweight. It produces a clean and instant electrical power. It produces 59 decibels of sound from 23 feet away. Comes with an LCD screen that shows the electrical output of this particular generator. Has an automatic low oil shutdown. Has a recoil start style. It provides a clean and safe electrical power to some of your most sensitive electrical devices such as smartphones and laptops. It’s easy to start. You only pull once it starts. It’s quiet since it produces only 59 decibels of sound. It is very fuel efficient, thanks to its PowerSmart tech. It’s very portable since it has a luggage-style handles. This generator needs a cool down period before refilling it with gasoline. As such, it’s slightly inconvenient. 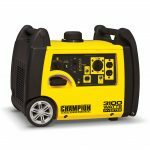 If you are looking for an efficient generator that can power most of your electrical appliances quietly and efficiently, then the portable Champion Power Equipment 75537i inverter generator is one of your top choice! Whether you intend to power up the appliances inside your RV or home, this great generator will provide a stable and reliable electrical power for all your power needs. With its 4 stroke 171cc OHV engine, it provides a magnificent 3100Watts at the start, and 2800Watts during its running time. Additionally, it dissipates excess heats thus allowing it to serve you longer and efficiently. The dissipated heat also increases its fuel efficiency. Since it produces only 58 decibels of sounds from 23 feet away, it becomes one of the best portable generators that you could find in the market, starting from $489. And when running on gasoline at 25% workload, expect this quiet portable generator to supply you with 2.8-3.1kW of electrical power for 8.5hours. Weighing just 95lbs, it’s indeed a true portable powerhouse that you could rely on when you go camping, or when you just want to power all your electrical appliances inside your RV. 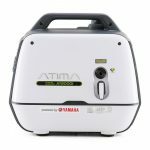 And to make sure that it’s more portable and mobile, this generator comes with an integrated carrying handle, for a convenient mobility. The generator also automatically adjusts itself to make sure that it powers your appliances with a sufficient electrical power. When you have a low workload, it will provide an efficient wattage that will increase its running time, all thanks to its economy switch technology that makes this adjustment very possible. It produces between 2800-3100 watts: 3100watts at the start, and 2800watts during its running time. When running on gasoline at 25% load, it works for 8 hours 30minutes. This generator only produces 58 decibels of sound from 23 feet away. It weighs only 95lbs. This is a quiet and a very portable generator. It has a wireless remote control; a push button electric start and an easy-to-pull recoil start. It has a low oil shutoff sensor to help protect it. It adjusts itself to supply only the needed power, thus increasing its running time when you subject it to light loads. It has built-in carrying handles. It also has an integrated mobility kit. It’s a RV ready generator since it has a TT-30R outlet for your RV. Has a 120V AC outlet; and a 12DC outlet. The generator is fuel efficient since it has an economy switch technology that adjusts it to supply only the required electrical power when you are powering few electrical appliances. Also, it dissipates excess heat, thus increasing fuel efficiency. The generator is very reliable. It provides enough electrical power for a reasonable amount of time. It’s a quiet and a portable generator that runs on gasoline, producing only 58 decibels of sound from 23 feet away. Also, it only weighs 95 lbs. It comes with a stylish flip-up handle, so that you can have easier transportation and mobility. The generator weighs 95lbs. Therefore, it’s heavy but still portable generator. It has no dual connectivity. The Honda EU3000iS is indeed a portable and powerful generator that produces a clean electrical energy. With its Honda GX200 196cc engine, this quiet yet portable generator produces 3kW starting power; and 2.8kW running power. With such kind of clean electrical power, you could power up your lights, fans, TV, computer and a blender. It’s a perfect machine or generator for camping and tailgating. Here you can read our full Honda 3000iS Review. The generator uses Honda GX200 engine with a 196cc capacity to generate a clean and efficient electrical power. It has a recoil and electric style starts. Fuel tank capacity is 3.4 gallons. It produces 57 decibels of sound. At 25% workload, it runs for 20hours on a full tank. It comes with 3 year warranty for both residential and commercial use. It’s a super quiet generator. It produces only 57 decibels of sound, which is quieter than normal conversation. It is easy to start. It has an-easy-to use electric start and recoil start. It’s fuel efficient. It has eco-throttle technology that revs the engine according to your load. Convenient for sensitive electronics such as laptops, tablets, smartphones, and computers. Capable of a parallel connectivity with another generator of the same make and model. This generator is costly. It costs $2,200 in some online stores. Adding oil could be a bit challenging. Doesn’t run optimally on regular gasoline. But it runs better on premium gasoline with 86 or higher octane. This generator is powered by a 4 stroke single cylinder, air cooled Yamaha engine. It produces 2000W starting power; and 1600W running power. It produces only 52 decibels of sound when operating at 25%load. Fuel tank capacity is 1 gallon. Oil capacity is 0.1 gallon. Oil lube type is SAE 10W-30. Uses unleaded gasoline to operate. Has electric circuit breaker to prevent overload. Also has low oil alarm. For fuel efficiency, it has smart throttle. Also has overload protection mechanism. It comes with a very trusted Yamaha engine. It’s affordable since it starts at $669.00. It brings great value since it is fuel efficient. Comes with a USB port. You will need an RV adapter for your RVs. Its customer support isn’t one of the best. This generator is made in China, making some customers to not trust this product. Have your recently suffered a power outage? Did you long to have your house warmly lit again or you simply wanted the RV kept cozy? A portable generator is just the right wand that you need. It does the trick instantly. Sadly, this solution can come with an unexpected menace: constant noise. This, obviously, would be an unwelcome guest, both to you and your neighbor. What, then, is the ultimate solution? Simple: you need to buy a quiet portable generator. Happily, you can get such a generator, the kind that runs quieter, with less vibration, at an affordable cost. And, believe it, some of the quietest generators in the market are not much louder than ordinary human conversation. Conveniently, the package comes with a large after- deal that offers you an advanced noise reduction service. You, therefore, get the quietest running generators without a hassle. In this quick voyage of discovery, let’s first narrow down to the small, quiet machines, mainly the 200w to 300w models of the quiet generators. These machines, for sure, pack enough power to keep home appliances running throughout. In any event, be confident that, in case of emergencies, this generator will work super effectively. As far as low noise levels are concerned, all factors considered, the inverter generator wins hands down. The latter is a wonderful, whisper-quiet machine unlike its noisier, conventional counterpart. In fact, the noise level chasm is huge since the conventional generator is designed to run at the same speed regardless of what is powered. In contrast, the inverter generator controls its engine speed depending on the present load. A portable generator can certainly make life easier, leading to greater enjoyment and fun. In medical facilities, use of a portable generator can actually be critical and life-saving. Without a doubt, this kind of machine can make life bearable during a sudden blackout that at times lasts for a considerable while. What then is the considered verdict? 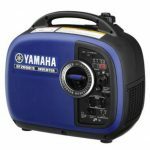 Yes, a portable generator is one essential gadget that you never want to miss in your home- store or car- boot. A portable generator helps you run critical appliances during power outages. These may include such day-to-day equipment like lights, refrigerators, the computer, TV and mobile chargers. Such job sites usually have limited access to power yet it’s needed to run the critical tools of work. the generator is a must-have for such events as concerts, outdoor parties, weddings, market venues and festivals. a stand-by generator will ensure you always enjoy to the full the best that nature offers. Certainly, you can enjoy the luxury you crave during that boating session as well as power the small freezer, radio, a mobile charger or the laptop. The best inverter generator will enable you have maximum fun and freedom while at it. It’s notable that the 1000w unit is available and fairly popular but its use is often quite limited. This one is particularly good for appliances that require high power, including heaters and microwave cookers that are vital for campers. An added helpful tool, as you ponder your choice for the quietest portable generator on the market, is our Wattage Calculator. It can as well help you determine the right size of machine. You can always download the handout worksheet with the vital information you need prior to buying. As you ponder this fascinating comparison, remember that a whisper-quiet generator will not nearly be as loud as normal human conversation. As it goes, more power usually means higher decibels. This, in turn, means that a 3000w machine will be louder than a 2000w generator. At the same time, decibel levels certainly increase as the generator load increases. While considering what kind of generator will ultimately suit you, keep in mind that some small quiet generators usually have a power output of only 1,000 watts, yet, interestingly, when put to full use, they can run surprisingly many appliances. Trouble, however, is that, for you to run many things at a go, you must, somehow, add the required wattage. Unless this is done, the 1,000w machine will generally run just a few appliances at once. In comparison, the 2000w quiet generator gets to allow you enjoy more than light power usage. Additionally, it’s pretty portable, meaning you can easily carry it along wherever you want to go. Even sweeter, it will easily power such energy consumers as heaters and microwave ovens that are important during camping events. Now, do you need to determine the right size for that generator you plan to buy? Quickly use our Wattage Calculator and, voila! You are good to go. A Measuring – Scale for Noise? Just how do you measure noise levels accurately? In order to determine this, we need to venture into some science history. And a good starting point is the origin of the term ‘decibel.’ One decibel equals one- tenth of a Bel. The latter term was coined by scientists in honour of Alexander Graham Bell, one of the greatest inventors in science history. Interestingly, a decibel sound designated as zero does not necessarily mean the complete absence of sound. This is simply the threshold of hearing; in other words, it is a record of the lowest sound that the human ear can hear. And certain data associated with decibel measurements do not seem to make much sense either. For instance, the difference between 0 and 130, speaking decibels, will not be 130; the difference is about one billion! What logic applies? Decibels scales are calculated logarithmically. More important to us, the loudness of a generator is usually measured in A-weighted dBA’s. This means that, the higher the dBA, the louder the generator. As it is, when selecting the right generator, remember that each type of generator differs from the other in terms of the noise produced. As previously hinted, quiet generators operate at between 50-65 dBA or lower. Mark you, this is quieter than the noise produced by a running refrigerator or an air conditioner. Common sense dictates that the further away a generator is placed, the lower the amount of sound received. Additionally, popular units of 1000-2000w inverter generator types are no louder than the average sound produced by human speech (50-60 dBA). Significantly, modern manufacturers tend to include noise data levels in the machines. Before buying a generator, you should check whether this is available in your targeted unit. The sound range covered usually is between full-rated load and a-quarter-rated load. Here’s an essential point: When making your selection, ensure you base your evaluation at full-rated load, the stage when the generator is at its loudest. Also important to establish is what actually produces the noise in a typical generator unit. Several factors are responsible for the noise emanating from your generator. First, the generator motor usually creates heat and sound. That’s why it needs a cooling system to stabilize. A stand-by generator can either be air-cooled or liquid cooled. Additionally, a reciprocating engine-powered generator normally produces noise and vibration that is unwelcome. Moreover, what we usually forget is that a generator unit is composed of an electrical generator and an engine. The engine segment is often taken for granted yet it’s the main source of noise. Remember, a noisy generator generally produces somewhere between 80-100 or more decibels. Effect of forces of combustion and mechanics. Current- fluctuations in alternator windings. This causes mechanical noise. Various parts of engine components vibrate and radiate as sound. Talking about generator noise, once again it’s important to note that numbers don’t make sense. Think of this simple hearing test: a human being can actually hear things at zero dBA. Further, at 160dBA, one’s ear drums will get destroyed. At 130Dba a person will feel pain. Again, it’s easy to presume that, as far as noise levels are concerned, lower decibels are better. Far from it, how comes that you might get annoyed by a neighbour’s loud phone conversation yet prefer much louder sounds at home when listening to your favourite music? It’s all subjective. Moreover, why would you prefer one generator’s sound over another? Might it be because you prefer the engine’s humming sound or its chug-along rhythm? Again, it’s simply subjective. Many factors affect the amount of noise produced by generator engines. These include the air density in which the machine operates. Serene Surroundings, for instance, have a bearing on the sound rating resulting from operations of two identical generator sets. A third factor is the cooling factor. A particular cooling system can alter a running generator’s quietness. This is because the sound produced by a cooling fan varies depending on factors like the operating speed and design of the fan blade. A fourth reason is the structure of regular generators. These often allow space for mechanical vibrations hence impacting on the sound and noise levels. In addition, the friction of various generator components usually results in more mechanical noise. Isn’t this solution simply too obvious and common sense? Yet it works! Just increase the distance between your house or residence and the location of the generator. For many, this alone may be the needed remedy. What practical steps may be taken to better achieve this? You can invest in long extension cords. This strategy achieves two main objectives: It makes sure that the location of the generator is not too close to your residence. It also makes the sound waves to be spread over a wider area, thereby significantly lowering noise levels. As a general rule, when you double the distance between your residence and the generator, you achieve as much as a 6-decibel level of noise reduction. A caveat is in order here, though. While doing this, do not disturb your neighbour’s peace. In addition, make sure you keep the generator in a dry stable place. This minimizes damage to your machine. Always remember that the position in which you place the generator directly affects the noise levels. As long as the place where you actually place the machine is not level then what you can expect is more noise. The noise is a direct result of vibration sounds from the engine. To solve this, simply ensure your generator is placed on a flat, level surface. Essentially, how may this be done? Using levelling feet, go ahead and make the generator as stable as possible in a position desired. Moreover, make sure that the exhaust pipe is pointed from home or that campsite. Again, this is a common sense solution that significantly reduces the noise menace. Many exhaust pipes are generally placed in horizontal position. The effect is that the sound waves spread in one direction. To remedy this, place the exhaust pipe vertically. In this way, the sound waves get directed up, instead of out. Remember that the exhaust is the loudest component of that machine. To optimize noise reduction efforts, you can use a standard silencer for your generator. Don’t forget that, the longer the exhaust piping used, the greater the noise reduction achieved. Therefore, go ahead and upgrade. One awesome solution is to replace the exhaust with a car or motorcycle muffler. To do this, just create a custom pipe system then link it to the exhaust. Certainly, this can be one of the most effective ways to counter noise. It helps in absorption and deflection of noise. While at this, get to ensure the generator gets enough airflow to cool and that the air to burn flows undeterred. This prevents overheating. Ensure the housing is spacious enough to achieve this. Before buying one, check the different designs and settle on the right design for a whisper quiet generator. It has been proved that good enclosures reduce levels of noise by up to 10 decibels. NB: Just in case the above methods don’t prove effective enough, consider upgrading. In time, you can obtain the quietest generator. Today, manufacturers of modern generators put great premium on the science of noise reduction in order to give customers value for their investment. The overall effect is to create a very quiet environment for consumers and everyone. As you plan to shop for the desired machine that you have always wanted, ensure you consult the list of the quiet generator reviews. With the wonderful suggestions readily on offer, your job is well cut-out.